As dendritic branching order increases, integration of electrical signals is increasingly influenced by dendritic geometry regardless of active membrane properties . Studies based on current-transfer measures suggest that changes in input resistance can contribute to optimize transfer of postsynaptic currents . Optimization occurs when the voltage attenuation factor and input conductance are linearly related independently of input location. Multi-compartment passive models from detailed dendritic branching structures of the Drosophila motoneuron, MN5, were constructed to start characterizing the relationship between dendritic geometry, signal propagation and spiking output in neurons. MN5 has a monopolar structure, with a main neurite giving rise to the axon and different highly branched dendritic subtrees. Current transfer was characterized as a function of axial resistance for different morphological phenotypes as induced by different genetic manipulations. Experimental estimations of axial resistance in MN5 and in other neurons  cover a wide range of values (ca. 45–400 Ohms/cm). 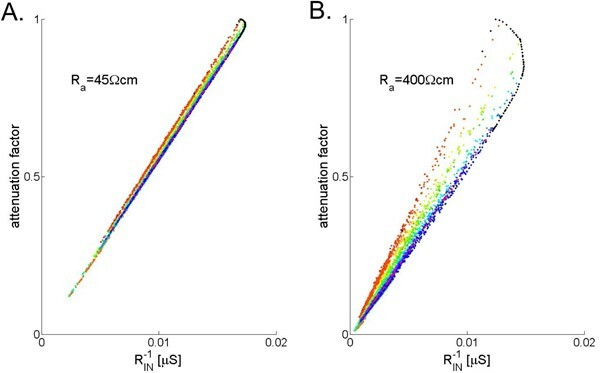 Our results from wild type dendritic trees show a linear relationship between input conductance and attenuation factor for axial resistances in the lower range. However, optimization is lost when axial resistance is large (see Figure 1), but still within physiological ranges. Nevertheless, when each subtree is considered in isolation, the optimization principle holds for a wide range of axial resistances, suggesting that the dendritic structure in MN5 supports independent computation in separate subtrees. Furthermore, different dendritic geometries can be induced by genetic manipulations of K+ channels or specific transcription factors. Increased MN5 excitability as induced by targeted K+ channel knock downs causes increased dendritic branching, whereas genetic introduction of a K+ current shunt causes dendritic elongation and diameter increases . We currently test whether such structural changes can be related to homeostatic mechanisms compensating for altered excitability in MN5. In addition, we are starting to expand our models by incorporating active membrane conductances based on in vivo patch clamp recordings of MN5. Scatter plot of voltage attenuation factor and inverse local input resistance for axial resistances equal to 40 and 400 Ohm/cm respectively. Different colors represent the different subtrees. Partial support for this work was provided by the National Science Foundation IIS0613404. Support for S. Berger was provided by the Interdisciplinary Graduate Program in Neuroscience, ASU.